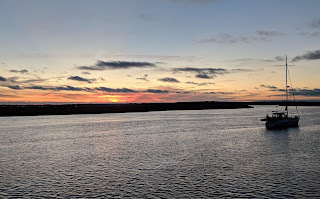 We are southbound on the ICW, between McClellanville and Isle of Palms, South Carolina. My depth sounder says we're in 12' of water, but we're also at a high tide of +6', and we can see flooding that tells us there's an additional foot or so of floodwater as well. Considering today's low is -0.5' we'd be plowing the mud without the help. This morning found us anchored in the South Santee River, just upriver of the ICW (map). 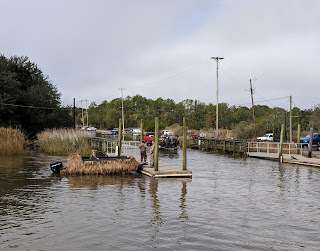 We had the hook down there by 12:30, an early stop, because there are no anchorages between there and the start of the skinny water at McClellanville, which we'd have reached at a tide of less than two feet and falling. Sunset from our quiet anchorage on the South Santee. 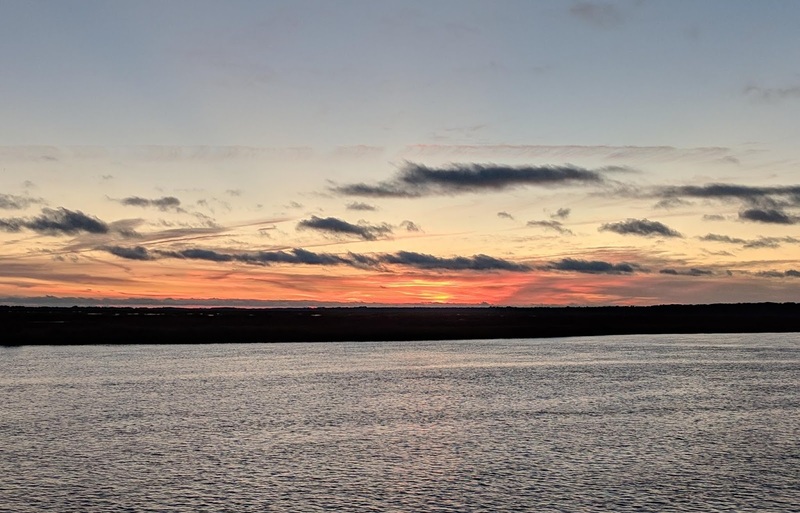 We left Butler Island early and pushed against the incoming tide all the way to Winyah Bay, a stark contrast from the nearly two-knot push we had coming into the anchorage Friday afternoon. As we made the turn past Georgetown the current slackened and then was behind us for the last couple of miles to the ICW turnoff. The several sailboats that spent the night in the anchorage with us all started later and were behind us in the ICW. Duck hunting season is in full swing, and we saw quite a few boats decked out in swamp camo at the boat ramp near the wildlife preserve. We could also hear the reports of the hunters' guns throughout the afternoon at our anchorage. Today we passed a trio, guns ablaze. We made it through several shallow trouble spots with plenty of tide help, including right at the turn into the ICW. 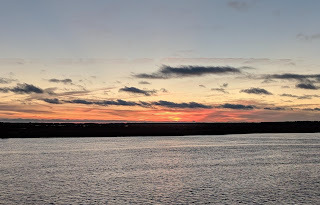 And for a while we had enough current behind us to give me a false hope of passing McClellanville and making the Awendaw Creek anchorage before the tide dropped too far. 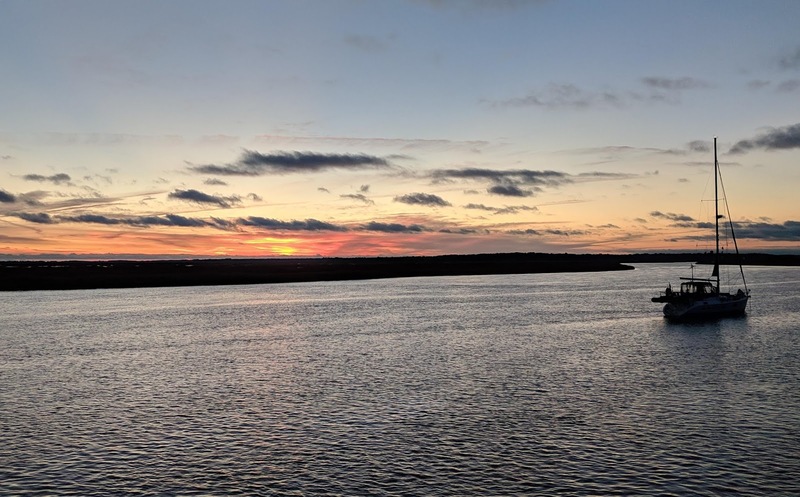 Alas, we had current against us for much of the run as well, forcing us to take the Santee River anchorage instead at an early hour. We anchored alone, but by the time night fell there were four sailboats with us. Duck hunters and their stealthy craft. Note the flooding well back into the boat ramp parking lot. After setting the hook we were a bit surprised to see several of the sailboats behind us continue on toward McClellanville. Surely at least some of them drew five feet or more. Even a large Fleming with perhaps a five foot draft passed us. The Fleming ended up stopping at the lone dock in McClellanville, just before the skinny stretch, but the sailboats continued and soon found trouble. We were just on the edge of VHF range and heard several reports of plowing through mud or finding depths below 5' (at current tide level). We were very glad we made the decision to stop where we did. We also heard a report of a buoy off station, and a boat nearly going aground trying to honor it. This morning we weighed anchor before sunrise, with just enough daylight to see the channel clearly, in order to have the best tide. We went through the shallowest section showing 9.5' at a tide of +5.5' (and rising), with maybe some flood water on top of that. I would guess three feet MLW, which corresponds to the year-old hydro surveys we have. At our current speed we will be in Charleston by 2pm. However there is one more shallow bit west of Isle of Palms which the hydrographic survey shows as "three to six feet" MLW. When we get to that stretch we will have just under three feet of tide, and falling. If we can't pick our way through, we'll be spending the night at Isle of Palms. I booked a slip (the one and only which fits us) at the Charleston Maritime Center starting tomorrow night. So if we make it to the harbor today we'll be anchored tonight. The Maritime Center can only be entered close to slack tide, so we'll likely spend some time in the harbor no matter when we arrive. In the morning I will call Komatsu to get a status on the fuel injectors, which I hope will be arriving tomorrow. We'll probably spend two nights at the dock, unless the injectors are delayed and we need to extend a bit.